Periodizing your triathlon training plan means that you alter the frequency, intensity and volume of your training sessions across a period of time, to help you arrive at your goal race in peak fitness. This will involve developing different aspects of your fitness at different times of the year. A key principle underpinning the theory of periodization is that you can only reach peak fitness two or three times each year. The cycle of training involves periods of overload, where you do more training than you are used to, followed by a period of recovery, during which your body recovers and super-compensates, that is, it rebuilds and regenerates at a slightly higher level of fitness than before. In a well structured plan, this cycle will take place within each week by including at least one recovery day, within each month by including a block of time each month focussed on recovery, and across a period of months within a year such as having a month of low intensity training. By intelligently periodizing your year, and putting recovery at the heart of each block of training, you ensure that you will never extend yourself into overtraining, illness or injury. It makes sense to plan a season around a key goal race, aiming to build fitness to a peak for that event. Clearly, not every athlete will race on the same day, so it makes sense to periodize the training year based on “time to your goal race” rather than basing it on a monthly calendar. However, time of year has an impact on the amount of training that you can do. Many athletes are limited in the winter months by the number of daylight hours and potentially hazardous, icy conditions. With this in mind, let’s look at two different approaches to periodizing your training. 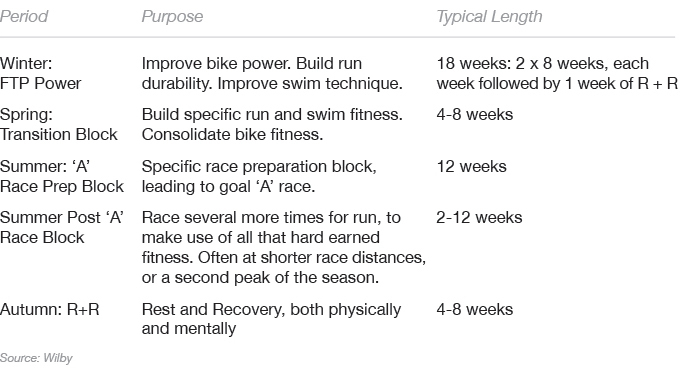 In Joe Friel’s Triathlete’s Training Bible book, he discusses the traditional approach to periodization. He breaks down the year into specific periods of training; Prep, Base, Build, Peak, Race and Transition. This traditional periodization usually has athletes completing mainly low intensity aerobic training during the Prep and Base phases, with increasing amounts of higher intensity training in the Build and Peak phases. This method has the benefit of allowing you to gradually improve aerobic and physical conditioning with minimal risk of injury. You can complete a high volume of aerobic training at relatively low intensity, leading to a deep level of aerobic conditioning. It forms a great “base” for allowing you to absorb more intense training later in the year. With the majority of races being held in the summer months, you are required to train in the base phase during the winter. This means finding the time and opportunity to train at a time of year when daylight hours are limited. Weather conditions can be their most hazardous in terms of cold, ice and snow. This makes bike training in particular very challenging. If you are racing 70.3 or full IRONMAN, you need to do progressively longer aerobic rides and runs in the Build and Peak phases. This means you might struggle to fit in higher intensity training to your year, limiting your ability to improve your bike power. I cover a lot of the benefits of reverse periodization in my article Reverse Periodization for Triathletes, and it is the method that I use exclusively to train my 70.3 and IRONMAN athletes. World renown coach, Brett Sutton, has also written about his very successful use of this approach when training his athletes, including Daniela Ryf and Nicola Spirig. In short, reverse periodization involves focussing on shorter, more intense workouts during the winter months, especially on the bike and in the pool, and then layering longer aerobic training on top of this as the goal race approaches. This approach is particularly suited to you if you live in the northern hemisphere, and are racing 70.3 or IRONMAN distance during the summer months, and have an established base level of aerobic training. 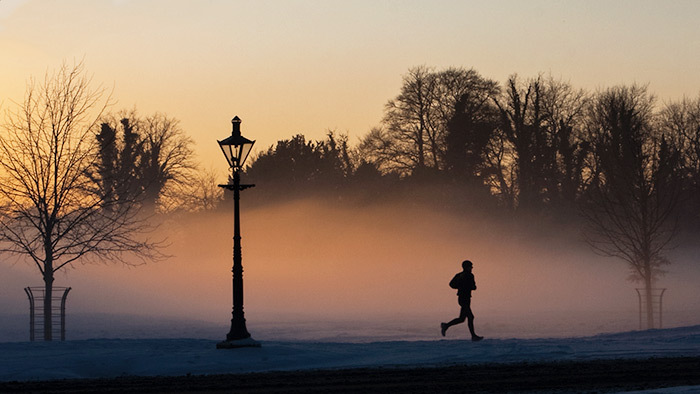 Winter running is all easy or steady, limiting injury risk. As your goal race approaches, your workouts will get longer and more race specific. You’ll also be able to make best use of the increasing daylight hours to get in those longer rides and runs. You might risk mental burnout from doing a lot of focused, higher intensity training during a period that is still a long way out from your goal race. You might feel “very fit” during the winter months, and be tempted to start your race block much earlier than you planned. This can be a good problem to have, but can lead some athletes to feel like they are peaking too early for their goal race. Each of these periodization approaches are founded in solid science, and a lot of successful athletes and coaches have used both methods. It’s simply a case of finding an approach that works for your life and available training time, and making the most of the time that you have available. If you’re feeling like you’ve been stuck on a plateau in your performance this year, I encourage you to try a different approach this coming season. Rob Wilby is a professional triathlon coach based in England, where his is head coach at both Team Oxygenaddict and Knutsford Triathlon Club. In addition to holding a BSc. (Hons) degree in Sport and Exercise Science, he is coach certified by British Triathlon, UK athletics and the Amateur Swimming Association. He is the host of the popular weekly Cup of Tri Triathlon Podcast, and is also a coach educator for British Triathlon. He specialises in helping age group triathletes rapidly improve, by focussing on maximising the effectiveness of training time and addressing their biggest performance limiters. Over the last 20 years, he has helped hundreds of athletes exceed their expectations, from completing their first triathlon through to qualifying for the World Championships.